The Next Stage: Women and Retirement: It’s the 38th anniversary of Roe v. Wade and we are still fighting for abortion rights. 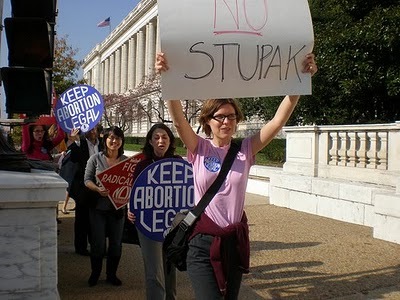 It’s the 38th anniversary of Roe v. Wade and we are still fighting for abortion rights. In 1973 after the Roe decision, I thought the battle had been won. How wrong I was. When I went to a pro-choice demonstration in DC in the early 90’s, I couldn’t quite believe that we were still fighting this battle. But I was heartened to see so many young women there and thought that soon this would be settled and we wouldn't be wasting our energy fighting for this basic right. Wrong again. When I dragged myself to DC for the 2004 March for Women’s Lives I began to worry that I might be fighting this battle until my dying day. Bush was president and had the power to shape the Supreme Court for years to come. And now with a Democratic president and (before the November election) Democratic congress, we got a health care bill which fails to safeguard abortion rights. There’s much in the health care bill which is a real advance: the expansion of Medicaid which will make a tremendous difference in the lives of the working poor; the end of life time caps on insurance policies which will mean that a major illness will not bankrupt families; the end of denial of coverage for pre-existing conditions; parity for mental health in all policies offered on the new insurance exchanges; young people allowed to remain on their parents polices until age 26. But all these very real advances came at the price of a devil’s bargain with anti- choice politicians. So prochoice activists are now gearing up for major battle in state legislatures as states develop the framework for the insurance exchanges mandated by the new health care law. Here we go again. And if that weren’t bad enough, Philadelphians are facing the tragic consequences of the failure to treat abortion rights as a women’s health issue. Please, please read Back-Alley Abortions in 2011: How Anti-Choice Zealots Force Women to Go to Dangerous Clinics Like Dr. Kermit Gosnell's. Women in my age cohort probably will not see the final victory over those who would deny women the right to control their own bodies. And to add to my dismay at having to gear up for this battle once again, we now have women opposed to abortion rights (like Sarah Palin and her Mama Grizzlies) who claim to be feminists! I get really depressed when women who are themselves pro-choice start buying into this saying things like: “Who are we to police the boundaries of feminism? Let’s be open to all women who want to identify as feminists.” Groups like Feminists for Life have been making these arguments for years but hearing this from members of the pro-choice community is something new. There is some good news. Fortunately, there is a generation of young feminists out there ready to fight for reproductive rights. I don’t think young women are going to meekly stand by and accept the loss of hard fought rights. But women in my generation thought at one time that we had spared them the necessity of that fight.